More than 100 tenants’ lives were upended after a 5-alarm blaze destroyed a five-story apartment building in North Bergen Sept. 28, and federal funds to pay for housing the victims ran out after five days. But today Oritani Bank’s charitable foundation stepped in and donated $10,000 to the North Hudson Community Action Corp. to help house, feed, and care for the 60 families devastated by the inferno at 92nd Street and Kennedy Boulevard. Oritani Bank is located in Washington Township in Bergen County, and has three locations in Hudson County. The money will likely be able to house the families until the end of the week as realtors aid them in searching for a new home. “This is an absolute gift from heaven,” said Joan Quigley, president and CEO of NHCAC. “This was keeping all of us here up at night. 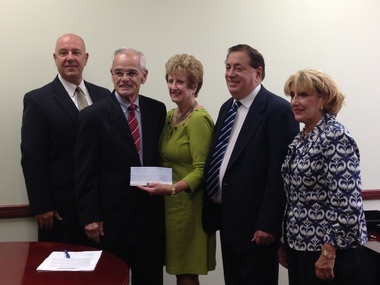 North Bergen Mayor Nicholas Sacco was grateful and thankful for the donation. The building was ordered to be demolished by the city, but the owner has stated that he wants to rehabilitate it instead, according to Sacco. Officials have been unable to determine the cause of the fire due to the damage to the structure, but arson has been ruled out. Sacco said that the building owner and city engineers are still working toward a final decision on the building. Other organizations in North Bergen have contributed to helping the families affected, with Palisadium Real Estate working for free to find apartments for those displaced.